Fully loaded with the exception of the monkey. The front brake pads arrived in today's mail so I spent ten minutes changing them out. The old pads were pretty worn compared to the new and braking feels a little softer but that's probably because the pads aren't broken in. I just need to take it easy on them for the first hundred miles or so. The replacement gas cap was also waiting for me and also just in time. The rubber "O" ring on the old Saab cap was starting to fall apart. I drilled a hole in the cap and added a tether to prevent the cap getting left behind. You may notice that I'm using the tail bag instead of the tank bag. I just have the tent sitting on top of the rear fender so there was room on the seat for the bag. The tank bag just didn't fit as well on the Ural as it did on the Beemer. JedR is meeting us at Bridget's school at 3:00pm and we are taking off from there. 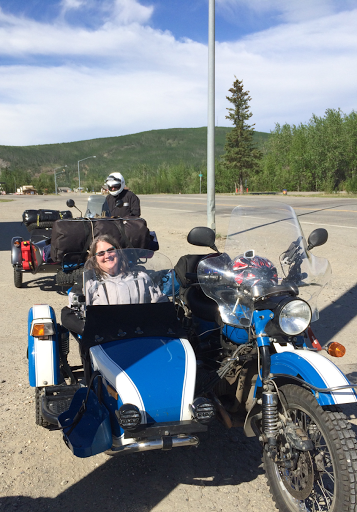 Here we are in Nenana, about 50 miles into the trip. We stopped just for a cup of coffee. We stopped at a Subway in "glitter gulch" aka the touristy area north of the Denali park entrance. The mud is from road construction. I'm with Steve, I want you to give Bridget the keys to the blog so she can share her candid thoughts on monkey travel. Whenever I saw WWII movies where there was a sidecar scene, the monkeys didn't look as into it as the riders. I know Bob loved being Dom's monkey, but he wasn't a reliable witness. Bridget looks like a good wholesome honest person. Let's hear her unvarnished account. I'm guessing she'll call it "300 miles in a rattle-can". I'll see if she wants to do it. +1 what Steve was suggesting and David is supporting. I'd love to hear from Bridget's point of view, likely something along the lines of "What the hack..."? Richard, apparently owner of the Subway shop near Denali was the guy who offered up a cabin for my use as lodgings while up there....of course, during that time, the weather and things conspired against that. The Subway shop had a big sign but it took us a while to actually find the shop. Pretty nice looking Monkey you have there Richard. Bridget is still smiling so that is a good sign. Glad you attached the tether tot he gas cap. That was only 50 mile in. 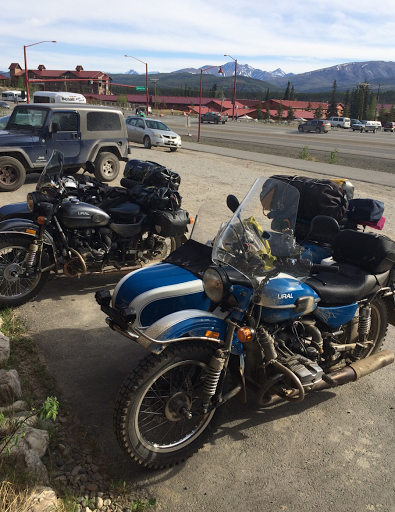 We didn't get to Talkeetna until about 10:15pm so it ended up being a long evening. 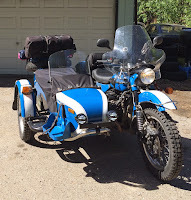 I told her that 300 miles would be a long day with the Ural. Looks like an awesome adventure. I hope Bridget shares her perspective ... who knows maybe she'll want to cross the continent! I suspect not... Today it's raining.